While Sekiro’s subtitle is Shadows Die Twice, most players will die more than two times. (I think I’m the first to make that joke, but please don’t tell me if I’m wrong.) 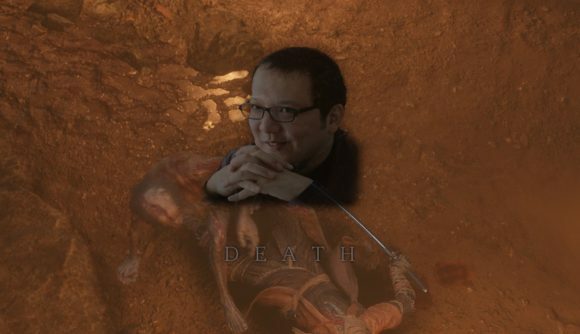 After so many deaths in Sekiro and the Souls games, many fans have a love-hate relationship with director Hidetaka Miyazaki. Thanks to the ingenuity of modders, Miyazaki will now show up to taunt you every time you fail in Sekiro. While the folks completing Sekiro no hit runs might not even get the chance to see the screen, but for the rest of us, there’s an odd comfort to seeing Miyazaki’s face every now and then. It’s a reminder that when we’re playing Sekiro, we’re not just being tortured by some cruel, unknowable god – just a man who wants us to die a lot in his videogame. You can grab the new death screen from Nexus Mods. If Miyazaki’s face inspires you to die a little less often, check out our Sekiro bosses guide, Prayer Beads guide, or Divine Confetti guide for help taking down the game’s nastiest foes and getting powered up on the way. Or you could mod the game to be way easier. I understand the internet will get very cross with you if you do, but don’t worry, I won’t tell anyone.